Hyperplasia is an increase in the number of cells. Hypertrophy is the increase in the size of a cell. Exercising at approximately 70-75% of your one repetition maximum can be enough stimulus to enhance a biochemistry change in the muscle. There are 650 muscles in the body, and their weight makes up approximately 40% of human body weight. Seek the advice and treatment of a Physical Therapist if you sustain an injury while you exercise. If you made a New Year’s Resolution to get into shape and you are still working out congratulations! You kept going when many people quit. Now it is essential to hang in there even if it seems like your strength development has stalled. It is important to stay faithful, stay focused, and the lag time should pass in a week or two. This lag time has to do with the nature of developing strength in muscles. Strength development is reliant on enhancing the cross-sectional mass of a particular muscle or group of muscles. There has been a debate in the medical world for the past 30+ years regarding the process that occurs to increase the cross-sectional mass of the muscle. There as two primary camps of thought with one being associated with an increase in the total number of muscle cells (hyperplasia) or the more commonly accepted theory of hypertrophy which is an enlargement of a given cell. In both cases, the muscle cell (s) must be stimulated with an outside source. The excessive stimuli cause a reaction within the cell and the number, size or both are affected, and the result is a bigger, stronger more powerful muscle. The science behind developing strength has been evolving for the past 100 years or more, but the common denominator in any study is the need for excessive stimuli to ignite the changes in the muscle cell (s). 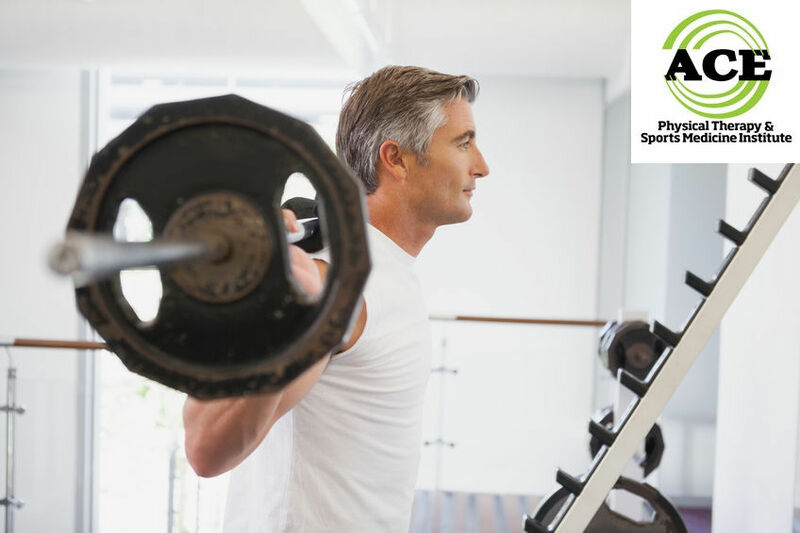 During the strengthening process of a given muscle or muscle mass, there is a two-phase process that requires participation in a consistent over-loading exercise routine of those muscles to get the desired results. During the first phase which usually lasts approximately one month, the cause of the strength development is purely an increase in neuromuscular activity. The nerve is responsible for signaling the muscle to contract and how hard and at what speed. Simply stated the muscle is not able to do anything until the nerve “tells it what and when to do it.” The best way to enhance an increase in neuromuscular activity within a muscle is to use the muscle repetitively. During the past four weeks of your strengthening routine, you have developed an increase in neuromuscular activity in the muscle, and consequently, the strength has improved in that muscle due to an increase in the efficiency of the muscle contraction. More fibers are getting involved when you attempt to use that particular muscle. The second phase begins to occur shortly following the completion of phase one, but there might be a slight lag time of a couple of weeks. The second phase is the true development of strength secondary to an increase in muscle mass, which is a result of a change in the biochemistry of the muscle. This phase never stops unless you stop your strength training routine. The over-load principle of a muscle mass via aggressive strengthening exercises will enhance a change in the biochemistry of the muscle cells. There is an increase in protein chains within the muscle cells that has been targeted by the exercise routine. The increase in protein chains signifies the increase in muscle size. The increase in muscle size secondary to an over-load stimulus can usually be correlated to an increase in over muscle strength. Your New Year’s Resolution might come to a crashing halt if you are not prepared for the possible lag in strength production that can happen as the muscles transition from phase one to phase two. You might feel that you are working out just as hard as you were during the first several weeks but you are not getting any improvement in your results. If you continue to exercise and “push” yourself to over-load a particular muscle mass, it will begin to respond in due time. In most cases, the biochemistry changes in the muscle cells can be seen within one or two weeks of the completion of phase one. If you have pushed yourself too hard in the first four weeks trying to improve yourself too quickly, you might suffer an injury. Take the time to treat your sore areas with the application of ice. Over the counter, NSAIDs are good to use if you are capable of using them. If your symptoms persist, seek the advice and treatment of a Physical Therapist. These healthcare professionals are skilled at treating musculoskeletal injuries, and they can help you modify your exercise routine so that you can return to it as soon as medically possible. You do not have to see your doctor before seeking the help of a Physical Therapist. Strength development takes a long time and a lot of hard work. There are no short cuts, and you will have to be dedicated to an exercise routine that “over-loads” a particular muscle to get the best and desired results of your New Year’s Resolution.